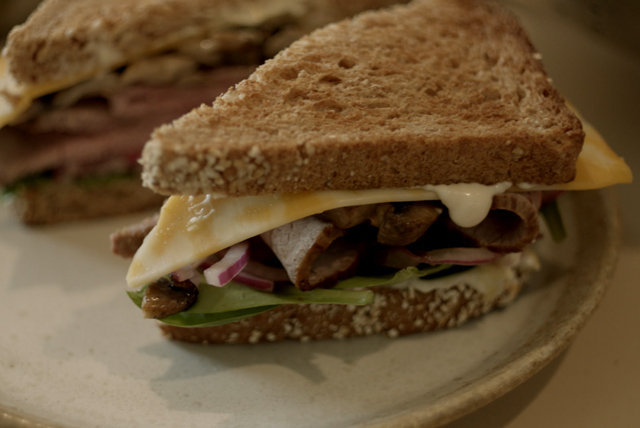 Sliced red onions and baby spinach leaves are the little touches that give this roast beef and cheese sandwich its bistro appeal. Combine onions and 1 Tbsp. dressing; let stand 10 min. Meanwhile, cook mushrooms in remaining dressing in skillet on medium-high heat 10 min. or until tender. Spread toast slices with mayo, then mustard. Fill with spinach, onions, meat, mushrooms and cheese to make 2 sandwiches. Enjoy this delicious sandwich with a mixed green salad and fresh fruit. Prepare using Artisan rosemary bread or your favorite bread.